Come celebrate Ramadan at Cafe Eden with a limited-time All-You-Can-Eat buffet for Iftar. At Café Eden in Downtown San Jose, we offer a wide variety of vegetarian dishes that will satisfy the veg lover in you! Our vegetarian menu is bursting with flavor - delicious breads baked fresh on-site daily, salads with fresh ingredients, and tasty dips. 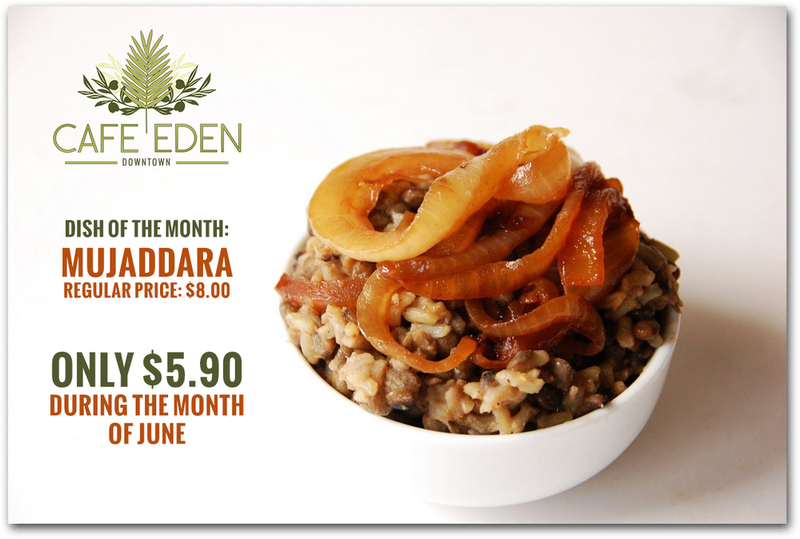 You don't have to sacrifice flavor to enjoy a healthy, vegetarian diet at Café Eden. Come in check it out for yourself! All veg lovers are welcome! Why a restaurant? Why Café Eden? The answer is: it is a passion and a mission. When I approached some friends to ask their opinion about opening a new Middle Eastern restaurant, the answer was always, "Why?" Why should I enter into a new venture after a successful career as an engineer and as a businessman in the manufacturing segment? Why venture into a tough business I knew nothing about? One person advised me that going into a business I knew nothing about at this age (beyond mandatory retirement age) was simply crazy. And when I consulted with my lawyer, she went a step further and said, "Zag! No!" To go into this business is not crazy at my age - it is crazy at any age! I started Café Eden because I have a passion for good food. While people of my generation used to walk the extra mile for a Camel, I used to walk the extra mile for a good bite. That passion for good food was channeled into my new restaurant, Café Eden, in downtown San Jose, where we offer some of the most popular sandwiches like Shawarma, falafel, and others. So far, we have attracted rave views from our customers. To add to the meticulously flavored sandwiches, we make our own bread on the premises and offer it fresh by the hour. Now my mission is to make those and other world famous sandwiches available to the widest segment of the public, who are the ultimate judge on whether we succeed in this endeavor.